Discover Gun Barrel City, the gateway to nearby Cedar Creek Lake, and all it has to offer while staying at our hotel, the Americas Best Value Inn and Suites Gun Barrel City. Our property is centrally located off Route 334. In addition to the many recreational venues and activities centered around Cedar Creek Lake, enjoy all that the area has to offer including many local restaurants and a close proximity to several local fairgrounds. Local area attractions include Whatz-Up Family Fun Park, Seven Points Flea Market, and Puris Creek State Park. Start your daily excursion in fine form by enjoying our complimentary continental breakfast served daily. Guests also have the luxury of choosing many of the local eateries in the immediate area. Our knowledgeable and helpful staff will recommend what best suits your taste buds and are always happy to help in any way. In addition to a convenient location, our thoughtful on-site amenities include coffee in our lobby, a business center, and 24-hour front desk to assist you with any of your needs. Maintain your exercise routine on the road at our on-site fitness center. Unwind with a relaxing dip in our jetted hot tub and outdoor pool, open year-round. Pets are welcome, charges apply. Enjoy the ambiance of your private guest room or suite with home luxuries such as free Wi-Fi, microwave, mini-fridge, coffeemaker, hairdryer, 32-inch flat panel cable TV, ESPN, HBO, table with chairs, free local calls and much more. 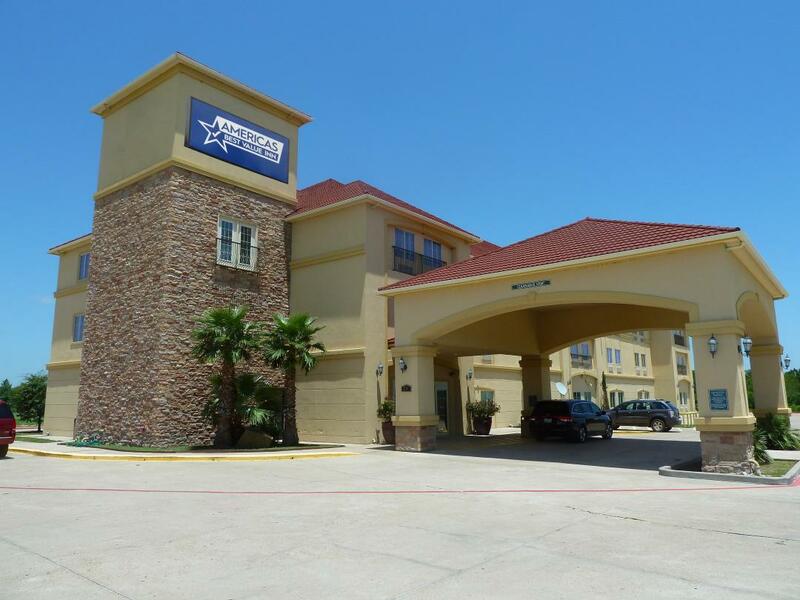 Americas Best Value Inn and Suites Gun Barrel City is your best choice when visiting the greater Dallas, TX area. Our location allows guests to take full advantage of the many cultural, business, and recreational venues this area has to offer. There is certainly something for everyone to enjoy during your stay with us. At Americas Best Value Inn and Suites Gun Barrel City, We've Got You Covered from the time you hit the road until your head hits the pillow. Lake Jackson Seafood, 0.3 mi. Hector's Mexican Restaurant, 0.4 mi. Chili's Grill & Bar, 0.7 mi. China Café Restaurant, 0.8 mi. Tommy's Bar B Que, 2.2 mi. Vetoni's Italian Restaurant, 2.3 mi. Coming with a group and need a block of rooms? Ask us about reserving group room rates. Plan your next meeting or family event with us . . . Check out these Gun Barrel City points of interests during your stay . . .
East Texas Medical Center, 1.8 mi. Tom Finley Park, 1.9 mi. Gun Barrel City Park, 2.1 mi. Cedar Creek Reservoir, 4.1 mi. King’s Creek Golf Club, 10.7 mi. Whatz-Up Family Fun Park, 3.7 mi. Seven Points Flea Market, 3.9 mi. Puris Creek State Park, 10 mi. Kaufman County Fairgrounds, 24.3 mi. Van Zandt County Fairgrounds, 25.2 mi. First Monday Trade Days, 25.7 mi. U.S. Coast Guard Auxillary, 9 mi. CVS Caremark Distribution Center, 30.5 mi. Pet Smart Distribution Center, 31.9 mi. True Value Distribution Center, 33.1 mi. Kohl’s Distribution Center, 33.4 mi.